Before we say goodbye to New York for another year, let’s look back on some of the best moments of this year’s tournament. Normally one to put the willys up his opponents, he was the one upended this time by Martin Klizan. Klizan’s a big lefty and tearing it up on the Challenger tour this year and one to watch. A surprise to some but after 12 years and winning over 600 matches, A-Rod played it smart and went out on his favorite court. An under or over-achiever depending on how you look at it. Knows when to ruin Federer’s tournament and brought a much needed killer instinct to court in the quarter finals. Ferrer vs. Hewitt and Ferrer vs. Tipsarevic were a treat for battling baseliner fans. No discernible weapon apart from being bloody hard to beat down. 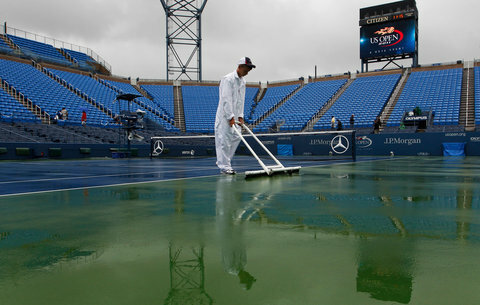 It used to be Wimbledon that was famous for it’s rain but New York is fast becoming the Grand Slam most disrupted by rain. For the 5th year in a row the final was played on a monday. It would be cheaper to reverse global warming than put a roof on Ashe though. This Aussie can’t stay away from controversy and gets a warning for not trying against Roddick. What does it take for this guy to get motivated? The wind got the better of Tomas Berdych in his semi-final against Murray. He couldn’t put a ball in play. Murray though could. What does that tell you about the difference in class? Officially the most successful doubles team in history but what does this say about doubles? Are the best players playing doubles or are ‘doubles specialists’ better? Fitting that it would be the US Open where his protege wins his first major. Lendl bared his pearly whites for all to see. Still no Cheshire cat though. The wait is over and Andy Murray is well on his way to Sir Andy Murray at this rate. He even had 007 cheering him on, which left Djokovic shaken but not stirred. What were your best or worst moments from this year’s US Open?